The highest quality blend of humic, fulvic, micro and macro minerals and amino acids which helps your body to nourish your thyroid and adrenals, detoxify, reduce the signs of aging, and build immunity. Body Ecology’s organic Ancient Earth Minerals is the only high quality mineral supplement of its kind that you can take in capsule form. Did you know that we have to eat significantly MORE food today to get the same nutrients our parents got in the past? It’s sad but true. Over-farming, chemical fertilizers and the stripping of nutrients to make processed foods means that food – even fresh fruits and vegetables -- are no longer what they used to be. "Government data from both American and the United Kingdom have shown that the concentration and range of essential nutrients in the food supply has declined in the last few decades, with double digit declines of iron, zinc, calcium, selenium and other essential nutrients across a wide range of foods." Today, it may come as no surprise that we are overfed and undernourished. When your body needs more food to get necessary nutrients, it is in effect, starving, even on higher quantities of food. And if you eat processed foods, which are stripped of most of their already low nutrient content, it’s no wonder obesity and fatigue are rampant these days. No matter where you look, you can see evidence that Americans are losing energy. From coffee to energy drinks, even kids and teens are looking for a quick energy boost to get through the day. What’s happened to our energy? Our diet is simply deficient in minerals. Even a healthy diet may lack the necessary minerals to boost your energy, detoxify and keep you feeling your best. In fact, your adrenals, your body’s chief energy producer (along with your thyroid), need a constant supply of minerals. Magnesium helps convert blood sugar to energy, and is the "anti-stress" mineral. Minerals can even help you sleep better at night! In fact, studies show that mineral deficiencies are at the root of every serious health problem. "How can I get enough minerals in my diet?" For decades Body Ecology™ founder, Donna Gates, has been teaching about the importance of minerals to feed your adrenals and help your body heal. These days, most high quality mineral supplements come in liquid form, making them too difficult to use for your on-the-go lifestyle. Ancient Earth Minerals are the highest quality blend of humic, fulvic, micro and macro minerals and amino acids. 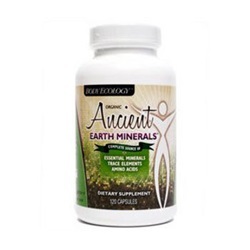 Ancient Earth Minerals are also the only high quality mineral supplement of its kind that you can take in capsule form, so you can benefit from a bio-available source of minerals and amino acids while on-the-go. The fulvic and humic minerals (fulvic acid and humic acid) in Ancient Earth Minerals are organic compounds that act as organic mineral carriers and detoxifiers. Research results suggest that humic and fulvic acid complexes enhance mineral and trace element uptake, supporting the maintenance of mineral and trace element balances without harmful buildup in the body's cells. Following dissociation of the minerals and trace elements delivered by the humic/fulvic acid complex, the residual humic acid/fulvic acid complex in Ancient Earth Minerals can chelate heavy metals along the intestinal tract, in turn reducing heavy metal burdens in the digestive system. The only way the human body can benefit from mineral nutrients is if they are available to be absorbed. Ancient Earth Minerals enhances this absorption process by enabling minerals to pass through cell membranes. The average plant derived mineral is less than 0.00001 micron in size, conceivably the size of a red blood cell. The body is made up of 100 trillion cells that need constant mineral nutrients to support the energy level for healthy, vigorous life. The fulvic acid in Ancient Earth Minerals is the transporter to the body's cells and humic acid is the carrier of minerals, trace elements and amino acids. Most people today are literally starving from mineral deficiencies, but you don’t have to be one of them. Nourish yourself with Ancient Earth Minerals and help your body reap the rewards of good health and well-being! The Food and Drug Administration have not evaluated these statements. This product is not intended to diagnose, treat, cure, or prevent any disease.